My son turned 14 this week. It's hard to describe how much he's matured in the past few months. Not only has his voice dropped an octave or two, but when he came back from New York after a week away, he looked like he had grown two inches. He is now almost as tall as my wife. I'm not sure he'll make my height, but he could have a late growth spurt like I did as well. I was a shrimp until about my Junior year when I shot up a few inches. The physical changes are the obvious ones. He seems to be taking charge of other areas of his life in as well. He got a guitar for his birthday and seems to be intent on learning how to play it. We took him to Outpost Music and kind of let him pick out his own acoustic guitar. 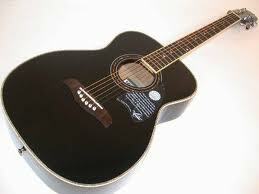 He chose a real nice Oscar Schmidt (by Washburn) black acoustic. It's a lovely instrument with a nice sound. I hope he sticks with it and does well with it. Mastering an instrument is a gift I never had, despite being a huge music fan. (Listening to music as I write this). We all go through phases, (I did) where we want to learn and master an instrument, and few stick with it. I hope he does. I think his football coach has had an impact on his sudden growth and maturity. I got the chance to hear this coach's philosophy a couple of days ago and it was interesting. He said that he told the boys that football is more than just two hours of practice 3X a week and a game. He told them that he expected them to carry the principles of the sport, teamwork, courage, discipline and respect into the other areas of their lives. He also preaches good health; eating well, getting enough rest, and more than once he has said "be sure and get off the XBox and move around." And finally, he's taken a keen interest in becoming better at his position. More than once already he has asked me to throw him some passes. In doing so, I've seen him become more confident and more skilled at it. The other day when I picked him up he said that they had done tackling drills, and he wished there was a way he could practice tackling. I wish I could help him with that, but told him he'd just have to do his best and not be afraid of kids bigger than him. I just thought it was good of him to recognize an area that could be improved on and want to improve it. A sure sign that he's growing up. Something has resonated with Ben because he seems to be slightly more conscious of what he eats, how he schedules his day and how he treats adults and his friends. I always knew he was a good kid, but now he seems to be proving it in a more mature way. (Side Note: I realize that he is a teen, and this whole behavior is subject to radical change at any time and I fully expect it will. Until it does though, I'm going to ride this wave. I'm loving it.